Hailed as "the female Jerry Maguire" by CNN, Molly Fletcher shares the innovative strategies that helped her thrive as a successful sports agent. Today, Molly is a highly respected CEO, entrepreneur, podcaster, and author. 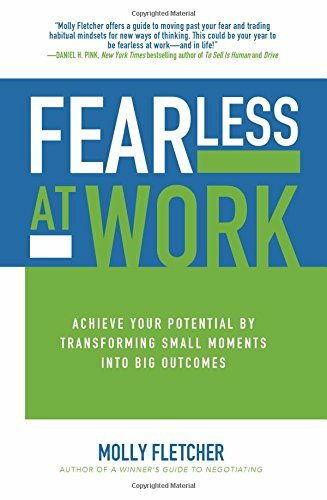 In this podcast, Molly will discuss her soon-to-be-released book, Fearless at Work: Achieve Your Potential by Transforming Small Moments into Big Outcomes - available April 10, 2017. Molly Fletcher is a trailblazer in every sense of the word, a rare talent of business wisdom, relationship brilliance, and unwavering optimism. In her messages to audiences around the world, [00:01:00] she shares the unconventional technique she used to thrive as a successful sports agent and now as a CEO and entrepreneur. She's often hailed as the female Jerry Maguire by CNN. Molly negotiated over $500 million in contracts and represented hundreds of sports' biggest stars. She's been featured on ESPN, Fast Company, Forbes, and Sports Illustrated. She has a passion to give people [00:01:30] the courage and the tools to dream, live, and grow fearlessly, a true game changer. Please welcome to the GDA Podcast, Molly Fletcher. Welcome, Molly. Kyle Davis: Hey, Molly. How are you? Molly Fletcher: Thank you so much. I'm great. It's a pleasure to be with you guys. You guys are awesome. Thank you. Gail Davis: You obviously didn't wake up one day and have folks referring to you as the female Jerry Maguire. Why don't you start and give us your story and how you got into this and [00:02:00] how did you gain that reference, I guess? Molly Fletcher: To spare your audience of the long version, I started with an agency in Atlanta that represented athletes and coaches and we had about six clients and a couple of NBA coaches, a couple of baseball players. After about a month or so of being hired as the marketing coordinator and I was like 25. I [00:02:30] went into the leader and I said, gosh, there's all these baseball players coming out of Atlanta, there's all these coaches here and all these coaches wanting to be NBA coaches. I said, "What is our growth strategy? How are we going about finding new talent?" The owner of the agency, a wonderful man said, "We get all referrals, our clients refer us new clients." I said, "Okay, cool." I said, "What if we went out and recruited guys, like went after them and build relationships maybe a little bit more proactively versus just a referral program?" [00:03:00] He said, "Well, yes, that would be an option." I said, "Can I put a business plan together on how to get baseball players?" He blessed it which was a gift and so I started going down to Georgia Tech where we were an agency based in Atlanta and I signed that year after 12 months of recruiting these guys and building relationships with the baseball coach at Tech. I signed a first and third rounder that year and continued to evolve. Fast forward, the next year, a second and a fourth rounder and [00:03:30] just continued to grow through draft players. Then I would go see those guys on the road and they would bring other players that were high draft round picks that were highly projected big league guys to dinners and to other things. I started to build relationships with those guys and I bring them deals. I bring them camp opportunities, endorsement deals, off the field deals, and those guys would flip over. Then I found myself with five or six guys that had evolved into the big [00:04:00] leagues and then I hired an agent to help me manage those relationships, and then of course, I was negotiating my existing clients' contracts with teams. It just evolved very organically and really very authentically. Two years later I did the same thing in golf with the PGA Tour and then I did the same thing with LPJ Tour and then I did the same thing with college coaches who all think they want to [00:04:30] go to the NBA. Fifteen years later, I woke up with nine agents running all these different vertical divisions and 300 plus athletes and coaches and broadcasters. I guess CNN decided that was an appropriate connotation for what I was doing and these other people have ran with that and so it's fine. It's fun. It was an amazing journey. I'm super grateful for it and I was fortunate to work with some incredible guys [00:05:00] and gals who are peak performers. They're people that wake up every day and do what they do at the highest level and to be able to be around them in an environment that's remarkably competitive was just a gift. I leaned so much and now I take that and deliver to corporations all over the world. Kyle Davis: When you're going into the college ranks to go find the next first round draft pick, whether it'd be for [00:05:30] the major league baseball or the NBA, what are you looking for because sometimes a lot of these players just don't transition very well from college to the majors? Whether it'd be that they're just absolute studs but they just don't know how to play in a team environment or something else. What are the intangibles that you're looking for and that you cultivate during that recruitment process? Molly Fletcher: Yes, that's an awesome question. [00:06:00] I think there are so many people that have talent and so my belief is that you need talent plus a lot of other things. You need talent plus passion. You need talent plus discipline. You need talent plus commitment. You need talent plus perseverance. I was trying to assess that and simultaneously, I was also trying to assess is this the kind of person that I want to work 24/7 for? Because that's what that business is. It's 24 hours a day [00:06:30] being in their world, anticipating their needs, their challenges, their opportunities, and caring enough that you take their call at 2 in the morning and at 7 in the morning on a weekend or a weeknight. It didn't matter. Time was irrelevant. The days of the week were irrelevant. I also, in addition to their skillset and their ability to execute, I also wanted to like them. That was important to me. I did not want to manage the relationships with guys that I didn't truly want to see [00:07:00] be successful. I felt we were fortunate enough to be fairly selective and that was a gift because the phone rings 24/7 in the agent business and I'm a mother of three kids, I wanted to be able to look down on my phone on a Saturday morning when I'm playing hopscotch or one on one with my daughter and know that, "Hey, listen sweetie, hold on a second I got to take this call," or that they were the kind of guy that I could say, "Hey, man, can I call you right [00:07:30] back it's 12 to 11 in a one on a game with my 12-year-old. It's important I'll be right back at you." I wanted guys like that and so I feel like we were very effective in signing guys like that. In major league baseball, the statistics are staggering. Fifty percent of first round draft picks make it. Picking the right guys was imperative and I had great relationships with scouts and coaches so I could really get behind the curtain. I built relationships with the parents so I understood [00:08:00] how driven was this kid to really make it and to really have success and how well do they understand that being a first round draft pick was step one. It was far from success. That was just the beginning. I would often tell kids, "Look, this is awesome. You're a first round draft pick. You just signed a contract for 50 million bucks and that's unique, but at the end of the day, let's recognize that we haven't done anything until we're in an all-star game, [00:08:30] until we've played and we're free agent." That's when we can get excited about the success you've had." As exciting as it was, it was also helping them understand. There was still a lot of work to do to be one of the best guys out there. Kyle Davis: I think having played sports and then have done other things where you go through the ranks, it's easy to get caught up in the fact that hey, I was on an all-star baseball team in high school and now I'm playing for this [D1 00:08:58] powerhouse or [00:09:00] now I have plenty of friends of mine who got scouted by MOB teams. They've never done anything past whatever the junior leagues are like AA or AAA. Hey, I played major league, but do you? It's always putting back in a perspective. Cool, you just got this major signing bonus but you're also the second string quarterback. Maybe you'll get some play time and it's putting these back into perspective and people hate [00:09:30] that. The people who respond to that positively are like I have some friends who are really motivated by that and they just love it. Molly Fletcher: Sure. Absolutely and you want the guys that recognize that. Tom Brady is a great example. Here's a skinny kid from the University of Michigan that's the 199th pick in the draft who absolutely should not have had the kind of success he's had. If you line that guy up however many years ago at The Combine [00:10:00] you would've never thought he was going to have the kind of success he's had. You've got to get inside the heads of these guys and really get clear on what's the driver and do they have the mindset. Brady was a guy that believed without question that he could execute at the highest level and because he believed so much all the guys around him that wanted to whether it was the linemen or the receivers or the coaches, they wanted to help him win and help him be successful. [00:10:30] We were blessed. We worked with Doc River [inaudible 00:10:35] Tom Izzo and Ernie Johnson, Jr. and just really special people and that's what made it fun. I didn't get phone calls like, "Hey, I'm in jail, I just got a DIU." My phone didn't ring for things like that and that was a blessing, certainly. Kyle Davis: I hope you also don't get the calls like, "Why aren't you booking me more?" Molly Fletcher: [00:11:00] Well, I did. I did. Kyle Davis: Because we get those sometimes and it's all right. Molly Fletcher: No, I did. Yes, I did and I get it. These guys and gals have a window of time to do what they do at the highest level. That's remarkably unique. When you call an athlete and say, "Hey man, look, a new baseball card just came out. These guys want you to sign a thousand of them. They're going to pay you 25 bucks a signature. What do you think?" You do the math [00:11:30] on that and it's interesting money no matter what. Some guys want to say yes and some guys want to say no to that or some guys don't think it's enough. It's like, "Dude, you can watch cartoons for an hour and a half and sign up baseball card with your face on it, that is a no-brainer. Those were the conversations where you had to help them recheck their reality and say, "Look, this [00:12:00] is what your mom made for an entire year as a school teacher and you can make it in an hour and a half and this by the way won't last forever." The minute you're not out there doing what you do, this goes away and it goes away fast. I felt blessed that I could have those kinds of conversations and be really straight with my guys as it relates to kind of how unique this platform can be. Gail Davis: I love your line that you were fortunate enough to be selective [00:12:30] and do business with people that you meet. Because we are approaching our 18th year, well we're in our 18th year, and that's really true. Life is just so short and it works both sides. You want to work with the speakers that are easy to work with and you want to work with the clients that are easy to work with. When you first start, you have to put up with all sorts of stuff but I love that, fortunate enough to be selective. Love it. Molly Fletcher: It's funny, when I was early in my career [00:13:00] I had an opportunity to sit down with David Faulk who worked with Michael Jordan. He was one of the earliest guys out there and of course, he worked with one of the best athletes in the world. I said to him when I met with him, we had lunch and I was pumped. I was 28 years old or something and I'm heading here with the guy that represents probably one of the biggest names in sports and I said, "Hey man," and I didn't represent NBA players so we didn't compete. He was very open and candid. I said, "David, give me something, man. I'm [00:13:30] young, I'm aggressive in this thing, and what have you got for me? What do I need to look out for?" He said, "I'll tell you one thing," and I'll never forget it, he said, "Don't sign anybody that you think isn't better than their problems." Molly Fletcher: Yeah, he goes and I go, "What do you mean?" He goes, "Somebody that's not better than their problems." That was such an awesome piece of advice because what that meant was obviously [00:14:00] don't sign anybody that isn't worth it. Look, we all have people in our lives who for whatever reason maybe they are better than their problems. Tom Izzo uses that line, one of my guys, the head coach of Michigan State. He'll say to his guys, "You better be better than your problems." In other words, he's saying you better put up so many points that you're worth me getting you out of jail when you've gotten a DIU. Those things are important and that really resonated with me because [00:14:30] it was like I need to make sure that I work with guys and gals that they're worth kind of the Saturday morning at 2 a.m., the questioning about deals and the amounts that you wanted to find a way to make them feel good about it and then make the deal feel right to them and me. Gail Davis: When you were dealing with college athletes, how much of it is actually working with them [00:15:00] versus their parents? Molly Fletcher: It depended on the athlete. Some athletes' parents were totally overbearing and you had to recruit the parents really not the kid. Some parents were really handing it over to the kid to make the decision and really own it. It really varied and I'm a fan of the athlete needs to at some [00:15:30] level engage if they can without letting it distract them from the things they need to do as a college athlete. You also wanted to get to the root of the motives of the parents. If the parents' motives was really about them, not the kid, that was always concerning. If the motives were really about protecting the kid to allow the kid to focus, that was fantastic. Unfortunately, today, we see a whole lot of parents living through their kids so that was just something we would just [00:16:00] consistently navigate. I would always love to look at these parents and say, here's a mother of a child who they've raised and loved and given everything to and now, all of a sudden, the kid is 16 years old and he throws a baseball at 98 miles an hour and can put it on that goal and everybody's coming out of the woodwork and they want to be their best friend. I would look at these mothers literally and say, "Look, I don't really [00:16:30] care if you sign with me. I don't. What I want you to do is get the right person and here's the questions that you need to make sure that you ask so that you protect your son." I remember so distinctly sitting in a boardroom and looking at these parents and the mother, it's so overwhelming to some of these folks who haven't ever been in this place before and I really in an authentic way wanted to put my arms around them and say, [00:17:00] "It's okay and here's the ten questions to ask and listen for. These are the kinds of answers I think you need to listen for and whoever you feel the most comfortable with, sign with them. But ask the questions because I don't want you to wake up and find yourself on a spot where you're being taken advantage of." That was always the thing that worried me. Kyle Davis: How much of it do you think is, especially for these early people who are making the transition from amateur athlete to professional athlete, how much of it is managing expectations? Molly Fletcher: [00:17:30] That's a great question, Kyle. It's a big part of it. I would always look at, for example, a young baseball player and say, "Look, you're going to sign for first round draft pick, you're going to be slotted as the twelfth pick, you're going to make X, likely around X, and you think you're a pretty good looking dude." They go, yeah. I mean they look at me like I'm a 40-year-old woman going like, "What are you asking me lady?" You think you're pretty good looking and they're well, I mean, [00:18:00] I … I said, "You put 15 million bucks in your back pocket and you are smoking hot." It was helping them understand that you are now going to go to training camp, spring training, and the last thing you want to do is arrive in an $80,000-car because now you go to dinner with everybody and they expect you to pay. There was all those kind of street smart things that we would talk about. Then there was, [00:18:30] look, the things you need as a first round draft pick on through the minor league system is X. The things you need once you get to the big leagues and through arbitration are Y. The things you need when you get to free agency are Z. Here's how I would anticipate managing that process for you. That was important to help them understand is that, look, if you're [00:19:00] hitting 230 and you're playing for the Toronto Blue Jays you're off-the-field deals are going to be minimal. If you're the catcher for the Cubs and you're hitting 300 and you're playing in a major market, your off-the-field deals are going to be pretty interesting. I think like anybody who's listening would say, the farther along any of us get in our careers the more confidence we have to s stay what we believe and we're more [00:19:30] comfortable losing the business if they don't connect with what we believe we can actually deliver. Managing expectations, Kyle, is an awesome question and it's absolutely a really big part of it. Kyle Davis: I have a few friends that have gone on to play in the NFL or Major League Baseball. I'm not going to name names. The friends of mine who have done well, mostly NFL players are the people that I … because I played football in high school. Careers [00:20:00] aren't that long and more often than not they're always thinking. I'm thinking about one kid who is a quarterback in my high school team, you can look him up but I'm not going to name his name now. He's always looking out for the economic vampire. He's always looking out for the person who is going to take the money and run and he's really walled himself off to like save every single dime that he had when he was in the NFL because his NFL career now is over and I'm 29. It's saving that money and it's really looking forward to it. Then I have another [00:20:30] person who played at the high school right across town and his whole career now is being the backup quarterback and he is loving it. He is making more money as a backup quarterback. Molly Fletcher: He's not getting beat up. Kyle Davis: He's not getting beat up and it's interesting because then I have another friend of mine who made all of his money and it was awesome and then year one, not even halfway to the season, boom, done, over, injury. Molly Fletcher: Wow. That's too bad. Kyle Davis: You're buying a car, you bought a house. Molly Fletcher: Right, [00:21:00] right, right. Kyle Davis: You can't afford it. You forgot to insure your knee or whatever. Molly Fletcher: Right, right, right. Gail Davis: Molly, are there many female agents? Are there more now than there were when you get started or is it still predominantly male? Molly Fletcher: Unfortunately, I don't think there is a ton more. I think there may be a few more but there was none, really. You know what I mean? There's not a lot of women that are representing like big league baseball guys or [00:21:30] NFL players and doing their contracts with the teams. There's plenty of women that are out there maybe doing marketing deals or endorsement deals and I think there is such an amazing lane for women to recruit players and that was candidly my passion. What I loved about the agent business was recruiting players, building relationships with the player and the wife and navigating their career and representing an entire family, not just necessarily one guy or gal. [00:22:00] I do believe and I hope that there is more women that can jump into the space because there is a need for it and I think that the ability to not just represent the guy, if it's a professional baseball player or a PGA tour player, but also the family is really unique. Gail Davis: I like that. Molly Fletcher: My phone would ring with wives going, "My son has 102 temperature, Molly, what do I do?" Or, "My husband just got traded [00:22:30] and I'm sitting here with two cars, a school, a house, what do I do?" I think my angle and I think what made it worked for me was I really did represent an entire family, not just the guy or the gal. Kyle Davis: One of the phrases that you just said was like jumping into a new space and one of the spaces that you're jumping into now is actually the world of podcasting, so welcome, like I own [00:23:00] it. If you could tell people about your podcast which is Game Changers with Molly Fletcher and it just sounds absolutely fascinating so take it from there. Molly Fletcher: My passion in life is to lead and inspire and connect people with courage and optimism and I feel like fortunately, I'm blessed enough to have access to a really awesome longer list of athletes and coaches and I thought, "Gosh, if I can get these guys on the phone and really ask [00:23:30] them questions that are more relevant to business people, what kind of a gift would that be to business people?" and I thought, "You know this could be pretty cool." We dove into it and it's been a blast. First of all, I am a lifelong learner and I love the opportunity to get on the phone with people that are incredible whether it's Tom Glavine or Smoltz or Izzo or Dabo Swinney or Nick Saban or executive leaders. [00:24:00] We ask them questions that I believe at the core will translate in to application for business people and that is my driver, right? Is how can I take the world of sports and take the context of it and apply it to people in business because to me that is such a transferable metaphor really in many ways. I've loved it. To be able to get on the [00:24:30] phone with these guys and ask them really amazing questions and get raw and candid feedback in a way that people can, when they're walking to the airport or when they're on their way to work they can listen to it and maybe it unlocks one thought or two thoughts that they can deploy in their world. It's just fantastic, it's a blast. I love it. I'm enjoying it tremendously. Kyle Davis: This is something that we've really or at least, I've really picked up on especially in talking with the business [00:25:00] and the technology people that we have come on here but it seems to me that a lot of the things that really make a top achiever or a top earner or a great brand person or anything else like that, it's always the same common thread that pulls through each of the stories or each one the things that they're putting out there. I'm wondering, if you're beginning to sense that as well and what are those themes that come to light that you're most happy to [00:25:30] touch on? Molly Fletcher: I think, number one, one of the things you see with people that execute at the highest level consistently is they're always curious. They're always eager to try to find ways to continue to learn and continue to grow and to continue to evolve. I think they believe they don't have all the answers. I think that they're doing a lot of things right but there's always the opportunity to continue to grow and [00:26:00] to get better. They have full confidence that is in many ways contagious. They have a boldness that is sort of a fearless boldness. They have the courage to ask the tough questions in moments in which maybe most people wouldn't that allows them to get really raw feedback from people [00:26:30] that again in turn maybe provides pretty awesome authentic connection with the people that they're wanting to connect with. It's a curiosity, it's a lifelong learner. It's somebody that has the courage and the boldness to ask the tough questions in key moments that tell me that it's a bit fearless. It's somebody that I think one of the things I've seen consistently is they're remarkably resilient. In other words, they know that they will fail [00:27:00] and that success is not always right around the corner but they're ready for no and they're okay with it because they believe that they have enough in their tank to recover from it and re-embrace whatever opportunity it is that they are pursuing. Geno, a head coach at UConn who's a remarkable women's basketball coach just ended a pretty special streak but he'll [00:27:30] be fine. He knows that it had to end at some point and he knows that he's a heck of a coach and he knows that he has an amazing group of kids, and so he will use it in a way that is very, very productive and remarkably positive. Curiosity, lifelong learners, resiliency, boldness, those are the things that I see consistently through and through. Whether it's a CEO or whether it's an athlete, whether it's a coach, [00:28:00] that is a common denominator. Kyle Davis: Those are the strands that we keep pulling out, that we keep finding, especially with whether it be curiosity but one of the words, I guess, if you're to put a word cloud together of keywords that people use on their task, authenticity would be put there, being your true self. I guess in line with that would be the boldness that comes from it. One of the things, especially with the tech people [00:28:30] that we talk about, failure and having failure is a beautiful thing but the word that is used in the text base is the pivot. You know you're about to fail then pivot into something else. Make that failure a positive thing. Kyle Davis: It's a beautiful thing. I love the pivot. Molly Fletcher: Hey man, I do too. Kyle Davis: You mentioned fearless though which brings us to the new book that you have which is the Fearless [00:29:00] at Work so if you could tell the listeners about the book. Molly Fletcher: The book releases on April 10th. It will be everywhere that you can buy a book and it's all about how oftentimes in life, it's little moments that really can create big outcomes. I don't think fearlessness happens overnight. I think it's a byproduct of a whole lot of little moments in which we have the courage to lean in to fear [00:29:30] and the byproduct of which is often pretty amazing results. It is a compilation of trades that we can make in our lives that will allow us to be more fearless. It's trade status for legacy. It's trade courage for consistency. It's trade rejection for education. It's trade worry for compassion. It's trade [00:30:00] avoidance for straight talks. It's broken down certainly into chapters that help somebody move through a fear that they may have or more than one and allow them to recognize that it isn't one big gigantic stop, but to try to give them the courage and the resources to realize it's a whole lot of little steps and that if they can use this as a resource to allow them [00:30:30] to take the little steps and provide them with the resources as to how, that the result will be a person who wakes up every day and lives more boldly and lives more fearlessly and lives in a space that they love. At the end of the day I think that the byproduct will be people that are doing what they love the most and are doing what they're the most gifted at. I'm excited [00:31:00] about it. It was fun to write and it was fun to push out. Gail Davis: Speaking of pushing out, is it still scheduled to release next Monday, April 10th? Molly Fletcher: Yeah, it's coming out on April 10th. It's so fun, it's awesome. It's been so fun. The subtitle is Achieving Your Potential by Transforming Small Moments into Big Outcomes and that's what the book's about. Kyle Davis: It's interesting, if you always look at something whether you're training for a marathon or something else, everybody thinks it's the whole distance. Kyle Davis: The 26.2 but the step that you have to start with. Molly Fletcher: Correct. That's a great analogy. That's a great analogy. You're exactly right. If you're going to train for a marathon, you got to break it down into bite size pieces and back into a three-month training program where you're running 10 and then 11 and then 12 and 10 and then 13 and 15. That's what this book is all about. My mission in life is how do we [00:32:00] get more people to really live inside of the best version of themselves. I think if we can be a bit more bold and a bit more fearless we can achieve that. Kyle Davis: I'm assuming that since we are a speaking-focused podcast, if you will, that that's the message that you're also trying to convey when you do stand up and you give your keynotes to the audiences in front of you, right? Molly Fletcher: [00:32:30] Yeah. I speak about 60 to 70 times a year all over the world on unleashing your potential, certainly, on fearless at work and those are the two keynotes that I deliver the most. Unleash your potential is how do we really move off and transform our lives into one that's even better. I walk them through a five-step process on how to do that. Fearless [00:33:00] at work is certainly more of an inside-out kind of keynote that we get people to have the courage to be more curious, that's more ownership, to be more resilient, to be more bold. I spent a lot of time out there whether it's sales teams, whether it's leadership teams and I love it. It's funny, people often think the transition from being an agent to being a speaker is this weird odd shift. [00:33:30] It's funny because the truth is being an agent was at the end of the day for me was about taking relationships that were very hard to cultivate, that were raw and creating a very authentic connection that was long lasting and that's what speaking is. It's walking on to a stage with a thousand people staring at you going, "Look, lady, I'm busy, so what have you got for me? You better make it good because I'm busy and I [00:34:00] got emails flying in. I got people that need me so what have you got?" Taking that moment and connecting, and connecting in a way that at the end the byproduct is a connection with each and every person in the room, whether it's a thousand people, 500 people, 150 people, 4000 people. Kyle Davis: No, don't worry about it. I have a dog as well. Molly Fletcher: [00:34:30] To me what I do now as a speaker and what did as an agent is actually very similar. Kyle Davis: Well, I think a barking dog is probably a good place for us to stop. Someone needs a little TLC. Molly Fletcher: Hey, look, I'm all about being authentic. Gail Davis: Here we go. Kyle Davis: Don't worry about it. I have a dog as well and I know I need to get back home to [Titan 00:34:52] and actually exercise him for once a day. Cool beings. Hey, if you're interested in booking [00:35:00] Ms. Molly Fletcher, you can do so by getting in contact with GDA speakers at 214-420-1999 or go in to gdaspeakers.com but when you go to gdapodcast.com, what you'll able to do is see the transcript from today's episode. You'll be able to buy Molly's new book available now on preorder via Amazon. Fearless at Work, we'll put the link up there for you so that you can do that as well. Then also check out our awesome podcast, Game Changers with Molly Fletcher. We'll [00:35:30] put a link in that on the page. I don't know. I have to get your cool icon. I ought to like steal your logo. My mom took a screenshot of it over the weekend and she said, "We need to take a cool picture." I'm like, "I don't know about that." Gail Davis: I like it. I like it. Gail Davis: Anyway, it was great having you, Molly, and congrats on all your good work and good luck with the new book and you're doing a lot of game changing out there so continue that. Molly Fletcher: [00:36:00] Well, so are you guys. So are you. Thank you for what you do. Thank you so much. Kyle Davis: Thank you, you have a good one, okay? Molly Fletcher: All right. Thanks guys.